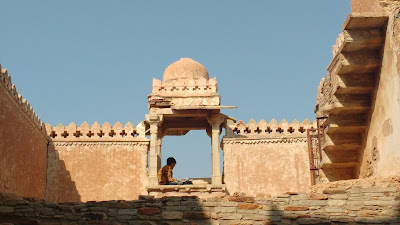 Chittaurgarh - or Chittorgarh - the fallen erstwhile capital of Mewar reverberates with only one story. 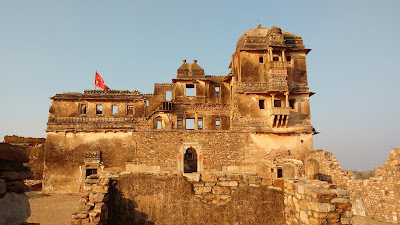 This old fort has stood witness to many important events dating from its formation by the Mauryas, to its eventual fall at the hands of Emperor Akbar. The grand remnants of the architecture and the two towers - Vijay Stambh and Kirti Stambh - dare to speak of a majestic glory. 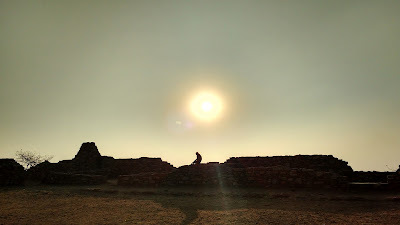 But, in the end, it is only Rani Padmini who has been handpicked by history to be eternally associated with this fort. 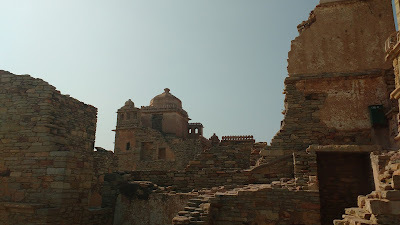 Chittaurgarh - grouped under the 'Forts Of Rajasthan' World Heritage Site - today is a story of a Queen's beauty, a Sultan's lust and a King's helplessness. Also, it is a story of bravery, pride and an ultimate sacrifice. 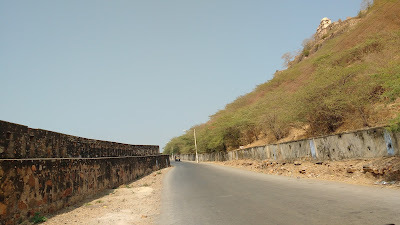 The road winds up from the base of the hill that houses the grand fort. 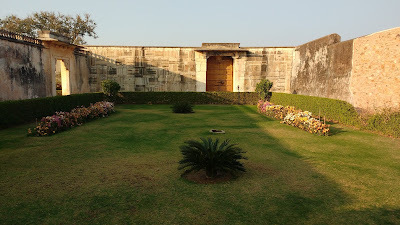 The trip through the pages of history begins at the Padam Pol - the first gate of the fort. 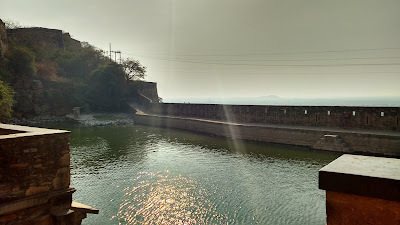 The road, then, rises steeply and after a few switchbacks, passes next to the Tulja Bhawani Temple (a curiosity, since it is more revered in Maharashtra), and ascends still to level off near the Rana Kumbha Palace. 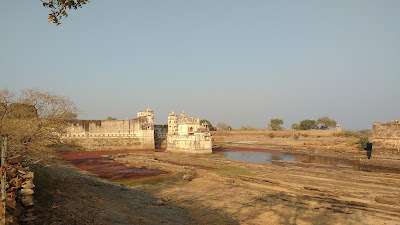 The Rana Kumbha Palace is supposed to be the oldest monument of the fort - and also the largest. Exploring the ruins of the palace can easily take at least an hour. 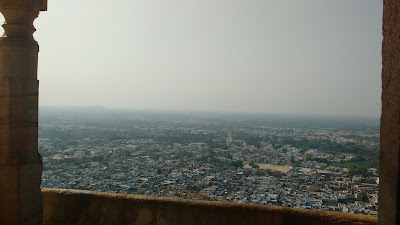 The views of the city below from the western walls and chhatris is amazing. However, it is the cellars of this palace which are haunted by history. This is where the story of Rani Padmini terminates - her ultimate sacrifice of jauhar (self-immolation) being committed here. Next up was the Meera Temple - dedicated to Meerabai, the ardent devotee of Lord Krishna. 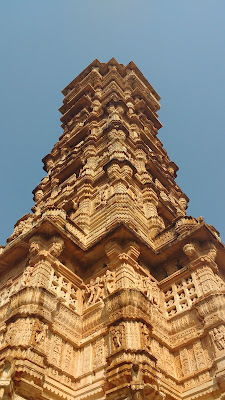 The 37 meter high Vijay Stambh is a major attraction of the fort. 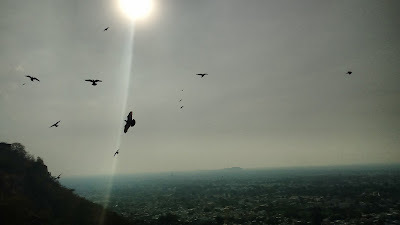 This 16th Century monument commemorating Mewar's victory over Malwa is also visible from the city below. 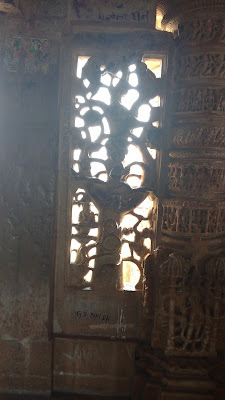 This is a 9-storey structure, carved in intricate detail and accessed by a staircase that winds up through its innards. Simply, beyond compare! 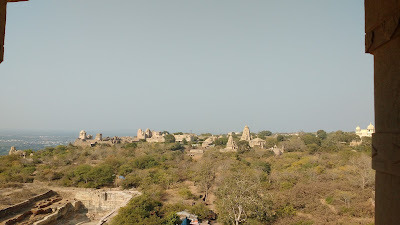 From the Vijay Stambh one can visit the Mahadev Temple and the adjoining Gaumukh. 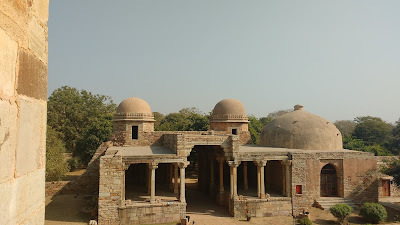 The pujari's house next to the Gaumukh has a stone relief of Rani Padmini. It is more of an artistic rendering than anything remotely portrait-like. Didn't click it as the girl there promptly started asking for donations. General's Palace - now a dilapidated langoor-infested shrine - and Kalika Mata Temple are next. 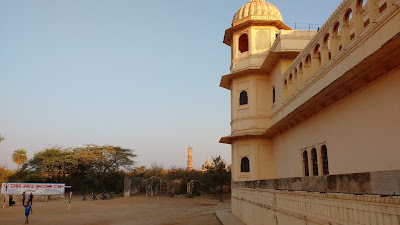 The Fateh Palace is now a museum and a portion has been converted to a school. The 12th century Keerti Stambh has developed cracks and is off-limits to visitors. 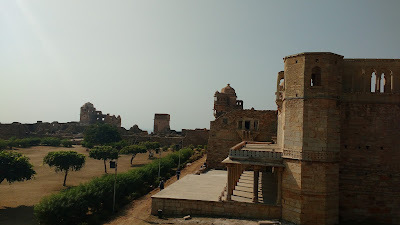 The last section of the fort is the Rani Padmini Palace. Most of this building is now converted into a nice garden. One room remains - and it houses a mirror. 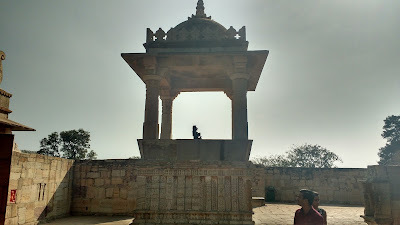 This mirror is at the same location where an earlier mirror showed a glimpse of Rani Padmini's beauty to a hapless Alauddin Khilji. Enamored by her beauty, he vowed to make her a part of his royal harem. 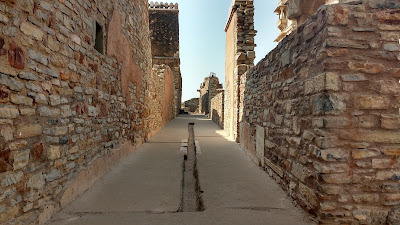 The ensuing seige resulted in massive loss for the Mewars, seeing which the queen opted for a Jauhar (self-immolation) and was joined by all the women-folk of the fort. 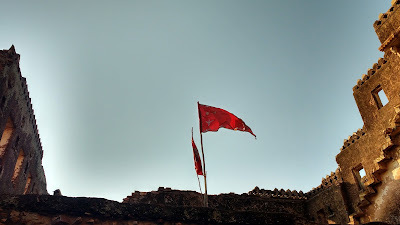 The men, now left with nothing to fight for, marched out of the fort dressed in sacrificial saffron robes to face certain death at the hands of the Sultanate. The Sultan's triumph at the conquer of Chittaur was short lived, for his ultimate prize was reduced to ashes. The fort was later recaptured and rebuilt, then lost and recaptured again, until finally succumbing under the might of Emperor Akbar. 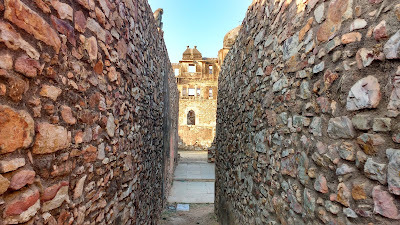 Chittaurgarh fort is a part of Chittaurgarh town. There's a railway junction which connects to Ratlam, Udaipur, Jaipur and Kota. 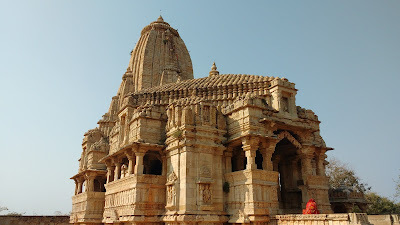 It is located on the road link between Udaipur and Jaipur. It takes two hours by road from Udaipur, and almost the same time by train as well. RSRTC bus connectivity is very good too. From the bus station, one can hire a rickshaw to the fort. the same rickshaw can be used to tour this immense fort and then come back to the bus station. The total fare should not exceed Rs. 300. As anywhere else, bargain hard. Cycles are apparently available on rent inside the fort for a price of Rs. 100. Tickets are Rs. 5 for Indians and Rs. 100 for foreigners. I did Chittaur as a quick day-trip from Udaipur by RSRTC buses. Incredible pictures. I wish I could go there again. The stories revolving around it are amazing.